The PADI Divemaster course is your first step towards becoming a PADI professional and is designed to give you both a high level of personal diving skill and instructor level knowledge. PADI Divemasters act as role models for students, leading by example, whilst assisting PADI instructors in both confined and open water. Training in how to assist instructors and assume the role of responsibility for others will be an important part of your training. Qualified PADI Divemasters may then enroll on the PADI Assistant Instructor or Open Water Instructor courses. For more PADI information please click here. We prefer to conduct this course as an internship over approximately 3 months, but please contact us for alternative schedules. a. PADI Advanced Open Water Diver (or equivalent). b. PADI Rescue Diver (or equivalent). 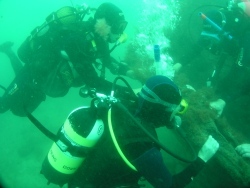 c. Minimum of 40logged dives. (A minimum of 60 logged dives are required for certification). d. Current Emergency First Response Primary and Secondary care (or equivalent first aid certifications which include CPR) completed within the last 2 years. e. Submit a medical clearance for diving signed by a doctor. The medical clearance must be current within the previous 12 months. We recommend that students intending to continue their training or hoping to work as Divemasters obtain an HSE diving medical certificate at this stage. 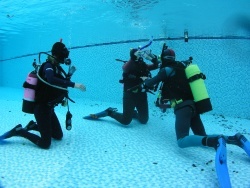 Divemaster students with an HSE Medical may also benefit from reduced boat fees during their training. Please contact us if you require further information. The shop at Divers Down is well stocked with all basic equipment which can be purchased prior to starting your course. £599.00. Price includes the Divemaster manual but some students may also require extra course materials not included. 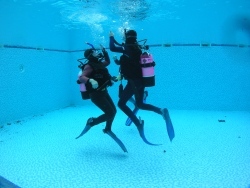 There is also an annual registration fee which is paid to PADI on completion of the course, also not included. We regret most boat fees are not included on this course. The Pier, High Street, Swanage, Dorset. BH19 2AR.